Slit Diffraction material picks up and bounces light. Fabricated entirely of durable self-extinguishing vinyl. 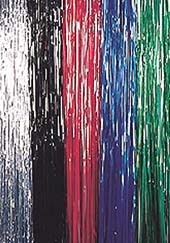 Each Slit Drape unit is 3' (0.9m) wide and as many units as needed may be used for a seamless, continuous curtain. 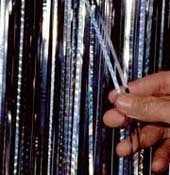 Slit drape is Rosco's exciting version of the familiar slashed curtains widely used in the display trade and the performing arts. Overlapping 1/8" layers of material provide a remarkable effect of bouncing, shimmering light. The diffraction used in some of the models refracts the light into spectacular patterns of colour. Slit Drape units are three feet (0.9m) wide and maybe ordered in 8' (2.4m), 16' (4.8m) or 24' (7.2m) lengths. The units can be secured onto a doorway, opening, wall, or any convenient location with staples, tacks or tape.